During lunch, not only did attendees get to eat, but they also got to take part in our lunch keynote discussion: Evidation Health - A Startup Case Study in Innovation. This live case study took an interesting (and lively!) look at not only what it takes to be a successful digital health tech startup today, but also what a good board member/CEO relationship looks like. Kilpatrick, CEO of Evidation Health, and Chapman, Evidation Health investor and Board Member, gave attendees a truly authentic and unfiltered look into what it takes to bring an organization from ideation to formation and from one round of funding to the next, all while balancing and sustaining growth and admirable work culture. One of the most thought-provoking points explored during the conversation was the exploration of the biggest challenge for a health technology start up: figuring out if you should focus on health investors or tech investors (health vs. tech was another topic that came up throughout the day). According to Kilpatrick, tech investors expect bigger, faster returns, while health care investors understand that it takes longer as a sector because of the immense elements and risk involved. Striking the right balance between health and tech investors can be hard, especially if an organization is under pressure to raise money fast, but it will always be worth spending a lot of time to better-understand who/what is the best fit for your organization. Kilpatrick and Chapman also explored how startups can prove their value in today’s digital health landscape. According to the duo, you need to have a compelling proof point to solidify your value in today’s ecosystem. These proof points need to not only be in more than one revenue channel, but also need to be critical points you truly know your market will value. An inspiring moment during the case study session was when Kilpatrick touched on her passion for building a work culture that is unique, productive, and one-of-a-kind. At Evidation Health, Kilpatrick learned that “building an incredibly productive work culture is driven by allowing people to be as flexible as they need to be to live their life and do their work.” She also found that bringing together employees from the health care world and from the technology world is a big piece of the puzzle that has led to her successful organization. Because Evidation Health’s product needs to do both things, this has been key. Previous: How does FDA plan to address the digital health industry? 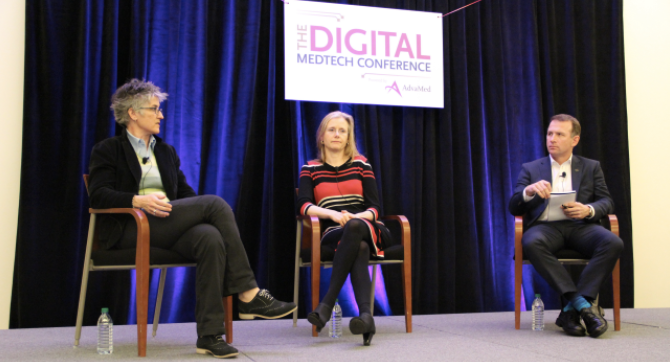 Carly Dell manages marketing for The MedTech Conference.